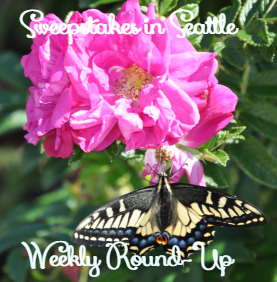 Sweepstakes in Seattle Weekly Round-Up 5/30 – Win $15,000, a trip to Key West, gift cards & more! Happy Monday! I hope you are having a good Memorial Day, remembering those who have sacrificed for our freedom. I am back from my time with family. I had a fabulous time, but over did it and came home with a sinus infection. Worth it, though to see my family altogether for the first time since 2008! I decided to take it easy yesterday, which is why the weekly round-up is on Monday this time. Get caught up on those sweepstakes – the summer ones are just getting going! Remember, Sundays I will only post the weekly round-up so you can get caught up and see if you missed any of the sweepstakes posted during the past week. Have a great Sunday and check back tomorrow for new sweepstakes! I’ll also share winner’s stories here, so if you win a prize, let me know and you can be a part of the weekly round up! Liz won a jar of mustard from the Stonewall Kitchens Sweepstakes! DeAnn won a Good Cook prize pack from the Challenge Butter IWG!